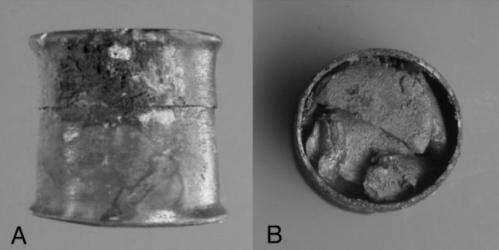 (Medical Xpress)—A team of Italian researchers studying the contents of a small tin found aboard the wreck of a second century B.C. cargo ship claim its contents are pills meant to cure eye or skin ailments. In their paper published in the Proceedings of the National Academy of Sciences, the team says that some of the ingredients found in the pills mirror those still used today to treat such ailments. The tin, known as a pyxis was found after excavation of the wreck Relitto del Pozzino between 1989-90. The sunken ship was first discovered in 1974 off the Tuscany coast and is believed to have met its fate in 140 B.C. The pyxis was found among other artifacts (a cup for blood-letting, vials, etc.) that led researchers to believe it belonged to a physician. Inside were small pills, each approximately 4 centimeters across and 1 centimeter thick. Careful analysis in the lab showed that the pills mostly contained zinc – approximately 75 percent – in the form of smithsonite. Other ingredients included animal and plant lipids, pine resin and starch. Because of the nature of their content, the researchers believe the pills were meant to be crushed and dissolved in water and then used as a topical agent to treat eye and skin problems. In addition to the physical evidence, the researchers also cite the writings of Pliny the Elder and Dioscorides which both describe using zinc based compounds to treat eye and skin ailments. They called the medicine calamina – it was obtained by scraping the walls of copper furnaces. Later topical ointments using zinc ore based material were called calamine. They also point out that the Latin word, collyrium, means "small round loaves" and was derived from words that describe the use of an eyewash. Together the evidence shows, the researchers claim, that early Roman and Etruscan physicians not only knew about the healing properties of zinc salts but how to obtain and use them to treat patients. Finding an intact medicinal compound from such a long time ago is extremely rare, they note – and being able to connect it with the writings of noted physicians of the time makes the find all that much more profound. Sounds like a mighty big pill to swallow! Good News! It's a suppository.